The Indian women's cricket team would be aiming for quick recovery from a rare setback when it takes on South Africa in the fourth Twenty20 International, where a win would give the visitors an unbeatable series lead, in Centurion, on Wednesday. After convincing victories -- by seven and nine wickets respectively -- in the first two T20 games, India allowed South Africa to stay alive in the series by slumping to a five-wicket loss against the hosts in the third match in Johannesburg. But having clinched the three-match ODI series 2-1, India would now be aiming to secure an unassailable lead in the shortest format series, which comprises five games in all. A win tomorrow will also make Harmanpreet Kaur and Co. the first to have won two series on a single tour of South Africa. It will also be a huge milestone after having won the T20 series in Australia. But it would be easier said than done. After a near flawless show in the opening two games, the Indians dished out a below-par display in third T20 to give South Africa a chance to make a comeback in the series. In the last match, India's middle-order collapsed after a fiery start to end with 133 in 17.5 overs. This was after being a solid 93 for two in the 12th over. Skipper Harmanpreet looked in a punishing mood during her 30-ball 48 and together with opener Smriti Mandhana (37) added 55 runs for the second wicket in quick time. But once the duo departed, the Indian middle-order collapsed like a house of cards. Veteran Mithali Raj too would be hungry for runs after posting a duck in her previous knock. The Indian bowling too looked ordinary in the last match. In the absence of injured veteran pacer Jhulan Goswami, the onus was on young fast bowler Pooja Vastrakar to lead the attack and she did it with aplomb picking up two wickets, giving away just 21 runs from her four overs. But Pooja lacked support from the other end as her new ball partner Shikha Pandey went for runs. Off-spinner Anuja Patil was also a big let down for India as she conceded 44 runs from her four overs and accounted for just one wicket. Come tomorrow, Harmanpreet would want her team to tick all boxes correctly in order to register a rare feat in the history of Indian women's cricket. With the men's team also scheduled to play their second T20 at the same venue later in the day, the onus will be on Harmanpreet and Co to set the ball rolling for Virat Kohli's team as they eye an unassailable 2-0 lead in the three-match series. On the other hand, South Africa would be a much more confident unit tomorrow, thanks largely to seamer Shabnim Ismail, who took her first T20I five-wicket haul in the previous match. Ismail's figures of 5/30 were the second-best by a South African in the format and helped the hosts get a target that they chased down with six balls to spare. They would also be hoping that Chloe Tryon, who struck a 15-ball 34 in the previous game, continues her good form. 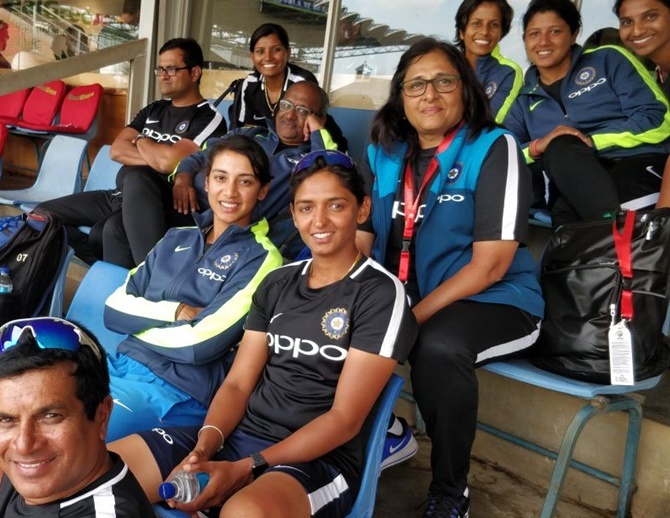 India: Harmanpreet Kaur (captain), Smriti Mandhana (vice-captain), Mithali Raj, Veda Krishnamurthy, Jemimah Rodrigues, Deepti Sharma, Anuja Patil, Taniya Bhatia, Nuzhat Parveen Poonam Yadav, Rajeshwari Gayakwad, Shikha Pandey, Pooja Vastrakar, Radha Yadav, Rumeli Dhar. South Africa: Dane van Niekerk (captain), Marizanne Kapp, Trisha Chetty, Shabnim Ismail, Ayabonga Khaka, Masabata Klaas, Sune Luus, Odine Kirsten, Mignon du Preez, Lizelle Lee, Chloe Tryon, Nadine de Klerk, Raisibe Ntozakhe, Moseline Daniels. Match starts: 4:30 PM IST.